I have a prized Canaan fir (Abies balsamea var phanerolepis) in my backyard. It's prized because I'm a native West Virginian and so is the tree. My wife knows that if we ever move, the tree is coming with us! 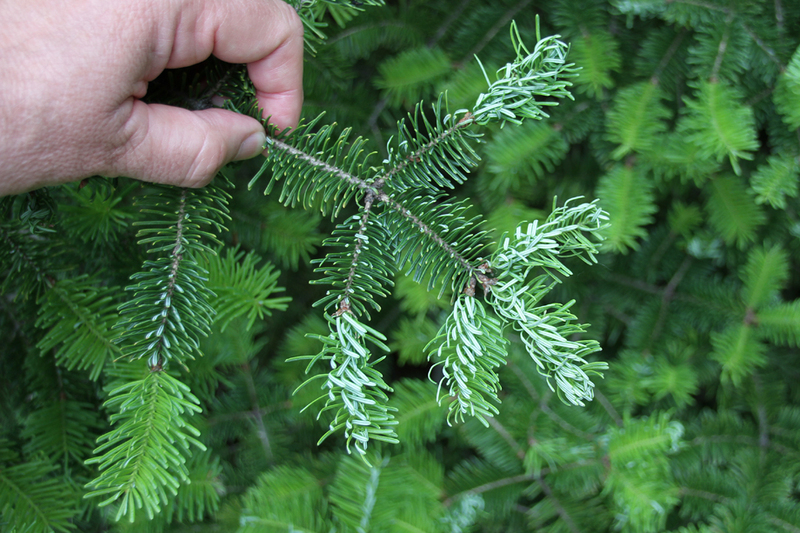 The common name of this balsam fir variety is based on its first discovery in the once isolated, high-mountain Canaan Valley in northeastern WV. Jim Brown (another native West Virginian and Professor Emeritus, OSU School of Environment and Natural Resources) spent much of his long career sorting out the five natural seed sources (provenances) of this tree. The provenances are all found in West Virginia which is why Jim and other WV natives like to use the alternative common name of West Virginia fir, or West Virginia balsam fir. Much of Jim's research focused on making selections that could be economically grown by Ohio Christmas tree growers to compete with Frasier firs (A. fraseri) grown in other states. However, freeze/frost damage to new growth was an initial problem encountered with the original Canaan provenance owing to its early bud break in Ohio. Thankfully, Jim found that selections made out of other provenances reduced the problem; trees didn't produce new growth until later in the spring. My tree is one of the later selections and has indeed escaped frost damage each year … until this year. On May 16, Greater Cincinnati experienced a record low temperature of 31 F. My Canaan fir was pushing new growth. At first, it appeared that my lovely (and loved) fir escaped damage, but as the new growth continued to elongate, curled and deformed new needles began to appear. The damage was mostly confined to one side of the tree and frankly, it was not very significant; much of the new growth remains unaffected. However, I was amazed at how much the damage mimicked symptoms produced by balsam twig aphids (Mindarus spp.). Indeed, I have made a number of close inspections fully expecting to find the blue-green aphid nymphs sucking juices at the base of deformed new needles; thus far, no aphids. After eliminating all other possibilities, I can only conclude that the twisted, deformed needles are the work of Jack Frost rather than Jane (stem mother) aphid.